If ever a movie lent itself to the Jameson Cult Film Club experience, I think that The Blues Brothers is it. Hosted by the Jameson Cult Film Club as a way of celebrating cinema, the events see the team trying to bring the movies to life, offering a rather immersive experience. It’s a wonderful way to honour classic films, and I think that The Blues Brothers really embodies the best type of film for that sort of adaptation. After all, it is a movie so famed for its cult status and audience participation that John Landis and Dan Ackroyd actively recruited fans from screenings to appear in Blues Brothers 2000. Second to The Rocky Horror Picture Show, The Blues Brothers is a movie were the energy and exuberance really can’t be confined to the screen, and I think that’s why the team were able to do such a wonderful job with it. After all, The Blues Brothers is a celebration of blues and jazz. As a result, anarchy and randomness are practically built into the film. It’s not a movie to be solemnly contemplated or to be mulled over and slowly digested. It is a move to live, to get swept up in and carried along inside. It’s a movie where the plot and the internal logic is secondary to the sense of fun from the cast and crew, where the action can suddenly shift from a relatively grounded car chase to an absurd free fall into the heart of Chicago. As a result, it’s a movie that benefits from any attempt to extend it beyond the screen. I think that previous Cult Film Events worked best at setting a mood – constructing the Nostromo from Alien or converting the Tivoli into a Travellers’ Yard. It felt like, wandering into the show, one was wandering into the film. Occasionally elements broke loose – the facehuggers falling from the ceiling in Alien fell on the crowd, while the twist in Reservoir Dogs literally came to life – but atmosphere was always the key. The talented individuals behind the scheme were inviting us into the world of film. With The Blues Brothers, it seems the opposite, that the wonderful people at the film club were bursting the movie out of the screen. And it worked perfectly. There was a superb live dance sequence or two, which really energised the crowd, not to mention Jake’s walk to his release. However, there were times when the film literally exploded out. The attack on the Brothers outside Elwood’s hotel was stunningly realised, as the whole auditorium seemed to be covered in debris. (Thankfully the bricks were a bit softer than concrete.) The auditorium itself, through careful use of set design and projection, beautifully transformed from the inside of the Joliet Correctional Facility to the interior of a church, with a wonderful use of the venue’s space. I can’t imagine how difficult it is to plan these things – to worry about distracting viewers and perhaps diminishing the film itself. However, the audience was never distracted or overwhelmed by the action unfolding around them. It never drew too much attention away from the screen or the film, and instead enhanced it. The timing and the pacing of these moments, these live action occurrences, was perfect – never too often, and yet never too rare. While the technical accomplishments are impressive, I think that the wonderfully perfect planning is what really grabs me about these events. There’s never too much or too little enhancement – there’s never any live action that reduces or diminishes a classic moment, while there are plenty that enhance them. There’s a respect for the film, rather than an attempt to one-up it. It feels like a labour of live – right down to the decision to serve chilli dogs as the pre-show snack of choice, not to mention the decision to have armed correctional officers patrolling the venue. The Village itself actually proved to be a fairly handy location. There were some very minor acoustic issues with the screening in CHQ, because the building hadn’t been designed to screen a film. The Village, on the other hand, is an awesome venue for a performance. Not only did just about every seat in the house have a great view, the sound mix was absolutely perfect – every single note came out of that sound system perfectly. The event used the latest blu ray transfer of the film, and I think it’s safe to say that Landis’ musical comedy has probably never looked or sounded better. I am, to be honest, generally quite wary of giving unreserved recommendations. After all, people have different tastes, and all you can really do is offer your own opinion. However, I would recommend that anybody who is a film fan and lives in the Dublin area checks this out. 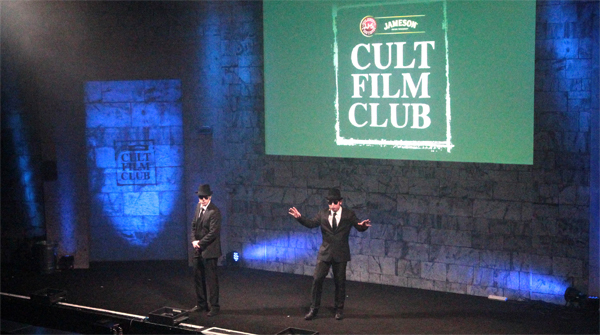 The Jameson Cult Film Club is free to join, and they give away free tickets to their events via raffles. I’d honestly recommend that people try one of their screenings at least once, if only because they are a joyous celebration of cinema. You can tell that these events are crafted by people who genuinely adore these classic films, and provide an opportunity to see them as never before. I honestly consider these screenings to be, along with the Jameson Dublin Film Festival itself, one of the highlights of the Irish film calendar.